The new Winnebago Horizon has the RV industry's full attention. Named 2018 RV of the Year by RVBusiness and Best of Show by RV Pro, the Class A motorhome is well-deserving of its accolades. No detail has been overlooked, including the use of a state-of-the-art Aqua-Hot 400D dual-zone hydronic heating system with continuous hot water. The Horizon features a bold, contemporary interior design reminiscent of the modern stylings one might find in a New York loft or London flat. Modern colors and finishes complement its clean, open appearance. It's a fresh, new take on the distinctive luxuriousness Winnebago is renowned for. Part of the Horizon's unique living experience is the warmth provided by the Aqua-Hot 400D heating system. Running conveniently off AC shore power or fume-free from the RV's 100 gal. diesel supply, it warms without the noise and dry air common with electric or propane units. 65,600 BTUs of heat is evenly distributed within the coach, from floor to ceiling, with precise temperature control in two living zones for maximum comfort, and one in the basement. Additionally, the compact unit provides continuous hot water for bathing, cooking and laundering without the limitations of a tanked system. "We've been doing business with Aqua-Hot for quite a few years," said Ryan Roske, director of product management, Winnebago Industries. "From the standpoint of its capabilities and heating power, it does a better job than a propane unit. It's the best system out there to use." 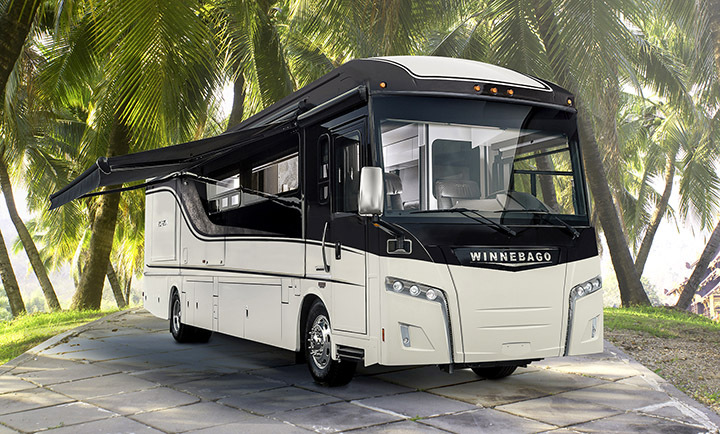 Winnebago's premier Grand Tour model uses the Aqua-Hot 450D. Since 1958, the name Winnebago has been synonymous with RVing. Today, the company manufactures Class A, B and C motorhomes, and fifth wheels and travel trailers. Its website is www.winnebagoind.com. The leader in state-of-the-art hydronic systems for RVs, trucks, buses and other vehicles, Aqua-Hot Heating Systems builds solutions for diesel, propane and natural gas powered applications. Its 600 Series is the first California Air Resources Board-accepted heating system for diesel motorhomes.